First a bit about this photo before I talk a bit about day 2 of the conference. Tonight we went to the grocery store to get some ice cream. 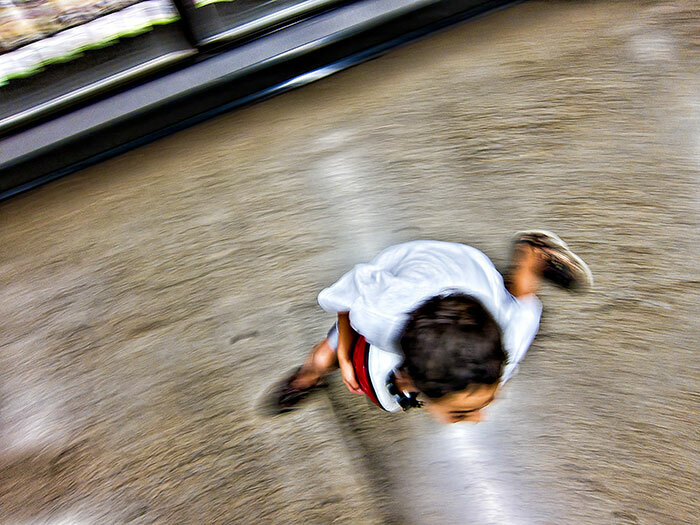 My oldest son was running around me in circles because he didn’t want me to take his picture. I took it anyway. When I got home and loaded it up on the computer I really liked it, despite it not being in focus. So day 2 of the Global Leadership Summit (GLS) kicked off with Jeff Manion who is the senior pastor of Ada Bible Church in Ada Michigan. Some of the main points I took away from Jeff’s speech were to “be open to receive”. How many times have we complained about our situation but were not open to receive change? Make each day count. Know where you are going and what is important. There needs to be a culture of ownership and commitment felt throughout the whole organization. What are the core value of your organization? Make sure that the people in your organization fit the culture. Before lunch Daniel H. Pink took the stage with an incredible lecture. Daniel is a business thinker, former White House speechwriter and best selling author. He spoke about what really motivates us based on his new book Drive: The Surprising Truth about What Motivates Us. This was a talk that really captivated me. When you get right down to it people are not motivated by what we all might think: money. Instead people are motivated by wanting to be a part of something that is larger than themselves, something that feed a higher purpose. Think about the things that you are passionate about. Are they strictly all about you are do they server a higher cause and purpose? Another thing Daniel Pink talked about was giving your own performance evaluations. This made me think of a post that Chris Guillebeau did several months ago on How to Conduct Your Own Annual Review. It’s good to take stock of your goals and where you feel you are at in reaching them. Finally I wrote in my notes “Conversations and interactions will change the world.” Without the initiation of any dialog we are not going to make change. Strike up a conversation with others be it in person or online. People taking small steps within their own world will create a cascade of change. After lunch Blake Mycoskie took center stage. Blake is the founder and chief shoe giver of TOMS Shoes. If you are not familiar with this company they sell shoes and with every pair sold they give a pair away to a child in need. I just love how Blake created a for-profit company that gives so much. They have given away over 600,000 pairs of shoes to children in need. Blake told a story of a shoe give-away where a woman came up crying and talking in Spanish. He couldn’t understand what she was upset about so he had a translator come and quickly realized that these were not tears of sorrow they were tears of joy. You see her 3 boys had been sharing a single pair of shoes which meant that one child went to school on Monday, the second child would then use the shoes to attend on Tuesday. This meant that all three of her boys would now be able to attend school. Isn’t it amazing how a single idea can make a huge difference in the world? One key take-away was this…Never ever, give up on somebody. Don’t try and hold people who were meant to come and go. At the conclusion of these two days I really didn’t want it to end. It was just such an incredible and life altering experience. I’m not sure where this will lead me or in what direction this experience will change my life. There is still so much to process and think about and bring into focus. But I do feel that in many ways I am a better person for attending. What this means for my life remains to be seen. If you ever get the opportunity to attend the Global Leadership Summit do it. It is worth many times the price of admission.